Great meat cooking temperature guide to ensure safe food handling. Getting the right meat cooking temperature is critical in preventing food borne illnesses. I have personal experience with what poor food handling can do to you. My nephew contracted Salmonella a few years ago. Although he survived the ordeal, he nearly wasted away for over a year before he made a turn around for the better. To this day he is very cautious about food preparation. And rightly so! I've prepared this chart to help you when it's time to cook meat. One of the best kitchen gadgets for getting the exact temperature is an instant-read digital thermometer. I use mine all the time. This is the one I use these days. Here's something else you should know. Take the meat out when it's 5 degrees before the desired doneness and let it sit for 10 minutes. The temperature will continue to rise and this way you won't over cook your meal. Plus it allows the juices to remain in the meat making it much more moist and tender. Ground meat needs extra special handling. All ground meats need to be cooked or frozen within 24 hours of purchase. During the grinding process, a lot of air becomes incorporated into the meat. This really fosters a great environment for the breeding of microorganisms, which cause the meat to go bad really fast. 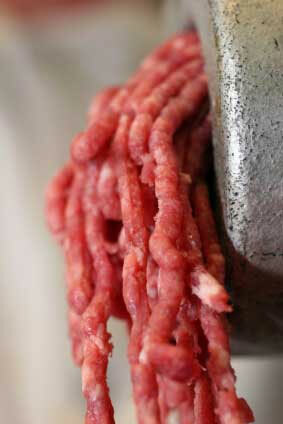 All fresh ground beef, veal, lamb and pork MUST reach a minimum internal temperature of 160°F. Here is the recommended meat cooking temperature for red and white meat. To be considered safe to eat, the following cuts of meat must reach a minimum internal temperature as indicated here. Stuffing, cook to 165°F whether cooked on its own or inside the bird. I do hope this has been helpful and that you'll refer to this page time and time again. I do because I've never been able to remember all of this off by heart. I really should commit it to memory! Oh well. Let's go back HOME from Meat Cooking Temperature. Hearty venison soup that's low carb and nutritious! Ground venison is the base for this venison soup recipe. Packed with nutritious vegetables and loaded with fiber too! Makes a huge quantity perfect for freezing. Hearty venison stew recipe. Low carb, paleo, keto and delicious. Prepare this venison stew recipe without any fuss or exotic ingredients. This is just plain easy to make, it's low carb and paleo friendly. And it tastes great! Western omelette that's low carb and easy to make. Satisfying western omelette is the perfect choice for a low carb breakfast meal. It will keep you full for many hours. Muffin in a minute for two. Quick and easy all low carb quick bread. A versatile muffin in a minute recipe for two. Try it toasted or make a grilled cheese sandwich. Use it like you would any kind of bread! High in fiber and deliciously nutty flavored. Big feta sundried tomato burger grilled to perfection. Hint of Greece. Chomp on this delicious feta sundried tomato burger served with a dollop of tzatziki sauce. Divine! Great low carb chicken casserole recipe ideas for simple everyday meals. Enjoy an easy low carb chicken casserole recipe that the whole family will dive into. Find a great selection of chicken casseroles that keep well and can be frozen.